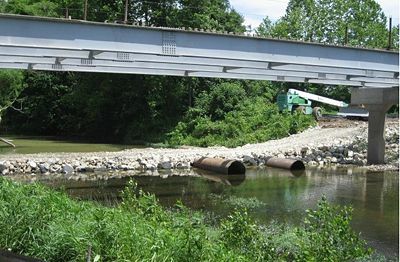 The Missouri Department of Transportation's Safe & Sound Bridge Improvement Program is a two-phase program to improve 802 of the state’s lowest-rated bridges by Oct. 31, 2014. Some 248 bridges have been identified for rehabilitation, and many of those are already under construction. They are being put out for bid in groups according to location, type or size to expedite the design and construction process. The other 554 bridges are scheduled for replacement and have been packaged in a single Design-Build contract. KTU Constructors has commited to complete construction by Dec. 31, 2013. Safe and Sound Modified-Design-Bid-Build Guidelines are presented here. 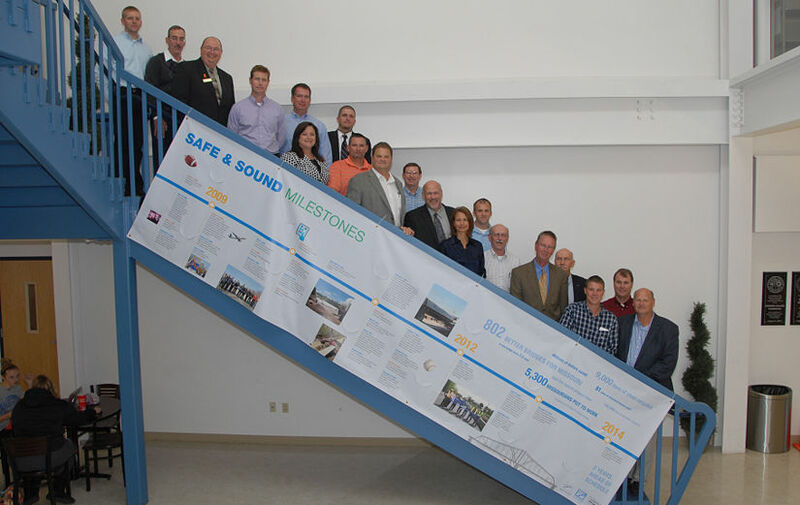 Safe and Sound’s (SAS) new direction is to move forward with 248 bridges as Modified-Design-Bid-Build (MDBB) and 554 bridges as Design-Build. We have a public commitment to have 100 of the 248 bridges under contract/construction by Spring 2009. The design-build package that includes 554 bridges has been awarded to KTU Constructors. The 248 bridges under the MDBB portion will have bridges grouped by type, size and location to accelerate construction schedules. Bridges may be grouped across district lines. The 100 "quick start" bridges will be those getting new superstructures or redecking or rehabilitation only. The remaining 148 bridges on the MDBB could consist of: new superstructures, redecking, rehabilitation or replacement. Issuing Bonds to finance the project. $50 Million/Year Bond Payment based on current interest rates that is approximately $700,000,000 (includes PE, CE, incidentals, contingency, R/W, utilities) for all 802 bridges. The Budget for MDBB will be provided by SAS. Prior approval shall be required from SAS Team to add scope using District funding above the current designated project budget. Performance Plus WILL NOT be implemented for design (since they didn’t set the estimate) but WILL BE implemented for construction based on award vs. final construction. Bob Brendel sent out a package of information via email on 10-7-08. Districts role in PI for the Design Build bridges will be very similar to that of the MDBB bridges. KTU will supply technical design and construction operations for MoDOT to relay to the public. More info from KTU to come. For 100 "quick start" bridges – MINIMIZE ROW or easements. For remaining 148 bridges – should be minimal but may include ROW and/or easements which require a ROW clearance. Each district has a select few individuals (District SAS Coordinator, Project Managers etc.) that have access to this database, please contact your district coordinator for a copy of this document. If a project bridge has conditions, meaning a number listed in the CE Category column in the above-mentioned database, please contact Buck Brooks with the Environmental Section for further guidance. Most SAS Bridge Projects have the NEPA classification – Categorical Exclusion (CE), but some are classified as a conditional CE. This is the most common condition as long as you stay within existing right-of-way, but the District will need to check the list to determine the exact classification. The SAS Team and the Environmental Section will work with the Project Managers to review the screening information and assist with specific requirements and/or permit issues for individual bridges. Asbestos and lead paint test results are also present within the informational documents folder, within the subfolder for each individual bridge. The District shall submit a Request for Environmental Services (RES) for each Bridge package to the Environmental Unit for review. The Federal Highway Administration will be reviewing plans and providing comments, however they are not going to require their approval to proceed with design/construction of these bridges, once STIP programming/funding updates are provided. The SAS team will disseminate information based on comments received. If the spreadsheet indicates "no" in guardrail column that means according to the EPG no guardrail is required at the bridge ends. If the spreadsheet indicates "yes" or is blank in the guardrail column that means guardrail is SAS MDBB General Guidelines required per MoDOT policy. Design exceptions may be pursued by districts to eliminate approach guardrail. If approach guardrail is used for bridge ends, Districts will design the appropriate length of need with an approved crashworthy end treatment. Guardrail should be tapered away from the roadway (1’) to avoid public perception that the bridge is narrower than it is and to avoid snow plow damage. Please use Standard Plan 606.00 Grading Limits for Type A Non-Flared Offset Crashworthy End Terminal. For grading between the Crashworthy end terminal and the bridge wing use "furnishing and placing rock fill" or "embankment in place" for the additional fill material needed behind the guardrail. If there isn’t enough room for placing rock fill or embankment in place behind the end terminal with in existing ROW, a design exception should be considered. If the Type A guardrail (Bridge Anchor, Transition, CET) will not fit due to constraints such as an entrance close to the bridge end, a Type C CET is allowable. The Type C CET’s are approximately 18’ to 21’ in length and do not require a transition or bridge anchor section and can be bolted directly to the bridge barrier. Include 3 channel post delineator signs for each bridge end as pay items in the contract. All design exceptions require signatures by District and the SAS Team. The Design Exception Form has a place for the SAS Team’s Signature. FHWA will have to approve design exceptions on ALL interstate bridges (on or over the interstate) regardless of the dollar amount. FHWA will not have to approve design exceptions on any other routes but the SAS team will send FHWA a courtesy copy of the design exceptions. 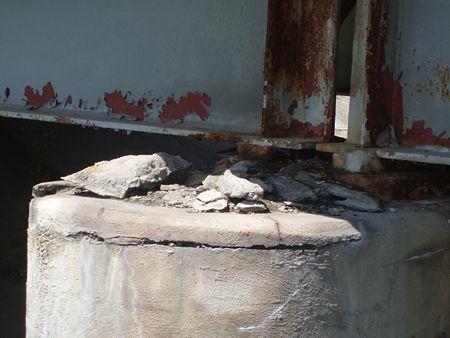 MoDOT district staff will be responsible for all construction inspection on the SAS bridges. Construction staff should not notice any difference in the 248 MDBB bridges with exception of coordinating traffic control with the Maintenance Division. The 554 design-build bridges will have very similar inspections as normal jobs, there will be some differences as there are no pay items. Payments will be made on a completion schedule basis. The bridge approach slab (bridge pay item) will be used on Major Routes only. The modified bridge approach slab (roadway pay item) will used on Minor Roads with concrete pavement. See Bridge Approach Slabs for more information. The approach pavement (not to be confused with the Bridge Approach Slab) for re-deck and superstructure replacement jobs will be optional pavement. All Interstate and Major Routes will need a pavement type recommendation from the Pavement Team. For Minor Routes, the optional pavement will consist of the contractor’s option of hot mix, cold mix, or concrete with details as shown in the special sheet Pavement Transitions at Bridge Ends. There have been several maintenance issues with non-reinforced concrete that is used as the approach pavement; therefore reinforced concrete shall be used in this case. If the depth transition is GREATER than 6” vertically, then the District should compute all corresponding quantities, list them on the quantity sheets and each item will be paid for by contract unit prices. Any pavement for a width transition should also be computed and listed in the quantity sheets. The Pavement at Bridge Approaches JSP and Pavement Transition at Bridge Ends Special Sheet should not be used for these cases. If the depth transition is LESS than 6” vertically, then the District should put the new special sheet titled Pavement Transition at Bridge Ends in the plans and the District shall use the new JSP titled Pavement at Bridge Approaches. Pavement replacement on existing grade (new bridge elevation = old bridge elevation) will be considered no direct pay (Minimal pavement work is anticipated in these cases). Pavement replacement/repair and any corresponding incidental work on SAS jobs with vertical depth transitions up to 6”, should be paid for by using the following pay item: 401-99.01 Misc Pavement, LUMP SUM. While the use of the JSP and Special Sheet listed above are strongly encouraged, in any case that the District feels obligated to fully design the pavement transitions in lieu of using the special sheet and JSP, they may do so. If the District chooses this route, please be sure to list the pavement as optional and the concrete option must be reinforced with at least No. 4 reinforcing bars (lat. & long.) 12 in. O.C. at mid-depth. District should verify if the widening/width transitions at the bridge ends will require significant earthwork to the point where ditch grades and/or hydraulics will be affected. In this case, the District should compute all corresponding quantities, list them on the quantity sheets and each item will be paid for by contract unit prices. District Designers should discuss this information with the assigned PM and District SAS Coordinator to verify if a full design is warranted. For pavement depth transitions, coordinate with SAS Team. MoDOT forces will be striping most SAS projects. Temporary raised pavement markers (temporary tabs) shall be included as a part of the contract, but could be under-run later depending on weather and coordination with District striping crews. Appropriate temporary raised pavement markers or permanent striping will need to be in place before the road is open to traffic. Permanent striping for divided highway and interstate projects shall be included as part of the contract. Any permanent signing required will be completed by MoDOT forces and will not be included in the contracts, except for the delineator signs at the bridge ends that do not require guardrail. All signed detours on road closures will need signing/traffic control sheets drafted up and sent to the appropriate Maintenance shed that will be installing the signs. Also, please send a copy of these signing plans to your District Safe and Sound Coordinator so these signs can be ordered in advance of construction. The shipment of the signs can take anywhere from 4 to 6 weeks, so please plan accordingly based on the project schedule. MoDOT Maintenance forces will ONLY be installing all traffic control devices for all Modified Design Bid Build and Design Build road closures. The contractor will be installing all traffic control devices for SAS jobs that are staged construction or jobs using a temporary crossover. The SAS Team has asked the Districts to prepare the detour signing sheets for the Design Build bridges to give to the Maintenance sheds along with the detours for the Modified Design Bid Build bridges. Along with that the SAS Team has asked the Districts to prepare a detour (even if the closure will not be signed) in ArcMap to be placed on the Safe and Sound webmap. For bridges with less than 400 AADT, the detour route DOES NOT need to be signed unless the detour is long or complex, district to make final determination. NO detour should be signed on a city or county route. Concrete barriers should not be used to close a road, use type 3 barricades and channelizers only. The 2 ft. x 2 ft. Safe and Sound signs can be permanently removed after road is closed for bridge construction. SAS has its own Point of Presence (POP) signs. The smaller 3 ft. x 4 ft. POP sign shall be used on Minor Routes and the larger 8 ft. x 4 ft. POP sign shall be used on Major Routes/Divided Highways. This sign looks very similar to the standard POP sign but has the SAS logo on it. The POP signs should be installed after contract award and remain in place for 3 to 6 months after bridge is open to traffic. A "completed as promised" sticker should be installed after bridge is open to traffic. District shall prepare detour/road closure traffic control plan sheets to give to MoDOT Maintenance forces and to be placed in the plans as "For Information Only". Maintenance may want a quantity sheet, but no quantities are need to be included in the plans as there will be no pay items in the contract for traffic control. The SAS Point of Presence sign will be installed for each project. These signs are in addition to the SAS signs (2 ft. x 2 ft.) currently being installed at each site and for road closures projects, these signs will be installed by MoDOT forces when the traffic control is a road closure. All projects with staged traffic control will require the district to prepare temporary traffic control plans to be incorporated into the final plans and appropriate traffic control pay items will be part of the contract. The contractor will be installing, maintaining and removing all traffic control devices. The SAS Point of Presence sign will be installed for each project*by the contractor, when the traffic control is listed as staged construction or for jobs using a temporary crossover. Include pay item in contract of furnished by Commission and install by contractor. Temporary traffic control may be required for bridge replacements such as traffic control under a bridge deck that is being replaced. If temporary traffic control is required and is dependent on the Contractor’s schedule it should be included in the Contract. All projects with temporary traffic control dependent on the Contractor’s schedule will require the district to prepare temporary traffic control plans to be incorporated into the final plans and appropriate traffic control pay items will be part of the contract. The contractor will be installing all temporary traffic control devices. Transportation Management Plans consist of strategies to manage the work zone impacts of a project. The TMP is a narrative that is submitted to FHWA for review. See Work Zone Safety and Mobility Policy - Transportation Management Plan for TMP Guidance. TMP are only required on projects that have a significant impact on roadway users. Project will be considered significant by meeting one or more of the critieria in Work Zone Safety and Mobility Policy - Significant Projects. Use Flume Drain w/ app slab special sheet. Do not use the special sheet, this bridge will have drain basins if it has a full depth bridge approach slab. Use Flume Drain w/o app slab special sheet. Major impacts or adjustments are not anticipated. Utility clearance letters will be required along with the utility JSP. These will be provided by the District Utility Engineers and placed in ProjectWise under the appropriate location. Incentive/disincentive clauses are not anticipated. Require SAS Team preapproval if used. Liquidated Damages: All SAS bridges that have more than 5000 AADT, the District should contact the Planning Division for the Road User Cost associated with them, for all other SAS bridge projects, Central Office will determine and insert the liquidated damage into the JSPs. Some of the SAS projects might be be setup as Required Combination or Permitted, as determined by Central Office, but most will have several bridges in a single job number. Submittal and processing of all 248 SAS bridges PS&E shall be completed using ProjectWise, the same way as all other STIP projects. This will allow CO to send plans directly to MoDOT's Online Plans Room through ProjectWise. Save all full size pdf files under the Contract Plans – Job No. Folder in ProjectWise. NOTE: This is the same procedure as a normal STIP job. DO NOT save the completed PDF’s under the MoDOT Design-Build Tab or the MoDOT Safe and Sound MDBB tab in ProjectWise, the files MUST be saved to the contract plans folder in the appropriate location. Save all supporting documentation under the Specs & Estimates Folder – Job No. Folder. This is the same procedure as a normal STIP job. All environmental permits/letters, asbestos surveys and inspections reports shall be saved to the Specs & Estimates folder. The Bridge Memorandum MUST be saved to the Specs & Estimates folder for each bridge. The review section will use this memorandum to verify the change in elevation from the existing bridge to the new bridge in order to determine if the pay items will be lump sum, contract unit price for each item or no direct pay. ALL plan sheets must be signed/sealed electronically by a Project Manager. Send an email to plan.submittal@modot.mo.gov when the plans are complete and stored in ProjectWise. The District will be responsible for completing the Roadway JSPs for the SAS bridges and the Bridge Division will be responsible for completing the Bridge JSPs. Each responsible party must place a copy of the JSPs into the appropriate location in ProjectWise, which is the same process as a normal STIP job. Place the job number, route and county at the upper right hand corner of each sheet. District Project Managers will be responsible for signing/sealing the Roadway JSPs and the Bridge Project Manager will be responsible for signing/sealing the Bridge JSPs. Place the JSP’s word document in ProjectWise under the Job Number – Specs & Estimates folder. If the specs and estimates folder is not present, please see that a Project Manager creates it. Use the following standard Job Special Provisions: This standard boiler plate JSP document can be found in the JSP Database under Safe and Sound Roadway Job Special Provisions Template. Please contact Natalie Roark for further information. Liquidated Damages (LD) Specified for Closure Time and Completion Date – Calendar Days with associated LD’s for road closure time. Calendar Days to be provided by District and Central Office will insert the LD’s for the project (See Liquidated Damages bullet under Contracting Issues above). Work Day Study (based upon CALENDAR DAYS) to be provided by District with Bridge Work Day Study incorporated. Pavement at Bridge Approaches. This will not be used on jobs that have full depth bridge approach slabs. Flume Drain – New JSP as of August 1, 2009. Roadway plans are to be prepared by each district. ALL signed and sealed PDF sheets shall be placed in the contract plans folders in ProjectWise under the job number. All supporting documentation shall be placed under the specs & estimates folder similar to a normal STIP job. ALL plan sheets to incorporate new sheet border. Title Sheet – Please list all bridge numbers on the title sheet that are included in the package. The SAS logo is on the bridge plans but not included in the roadway portion. Removal of Improvements - The district should determine whether to include any sign and or striping removal in contract. Mobilization – This should be included on each project. Plan & Profiles Sheets – Only on necessary jobs. Some projects may only require a Plan Sheet without a profile. ROW Plans – If necessary, most SAS bridges will NOT require new ROW. Reference Point & Coordinate Points Sheets – as necessary. Traffic Control Sheets – see above section titled Traffic Control. Erosion Control Sheets – completed as necessary. Lighting & Signal Sheets – very limited, contact SAS Team for any questions. Signing – very limited, contact SAS Team for any questions. Pavement Marking Sheets - see pavement marking section of this document. Bridge Drawings – Include ALL bridge numbers here. Cross Sections – May be needed in areas of guardrail widening if Lump Sum pay items are not used. Bridge plans are prepared by CO Bridge Division or Consultant where necessary. ALL bridge plans must be signed/sealed and submitted through ProjectWise, the same way as a normal STIP job. ALL bridge supporting documentation must be submitted through ProjectWise, the same way as a normal STIP job. The schedule for submitting a SAS job to the Bidding and Contract Services Section in Design is the same as a regular STIP job from the May 09 Letting and moving forward. The PSE Due Dates are on the MoDOT internet. This page was last modified on 14 March 2018, at 12:45.